Jenny qualified from Kings College London in 2009, also being awarded upon graduation the Jack Wheatley Carlton Hunter Prize, having set the “highest standard of exemplary conduct as regards to courtesy, humanity and kindness in the treatment of patients.” Jenny enjoys all aspects of general dentistry, and is currently studying a course in child and adolescent counselling, aiding management of young and nervous patients in particular. 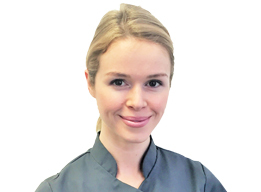 Outside dentistry, Jenny loves precious family time with her husband Marcus, and three young children, Hugo, Auby and Martha. Most weekends Jenny enjoys plenty of Steam train rides requested by her boys, and is involved in their busy school and social lives! Holidays are spent rambling across Dartmoor with her family, and in the rare quieter moments, likes yoga, ballet and tennis.